More Of That's unbeaten record went up in smoke as Medinas caused a bit of an upset at Newbury. With Lac Fontana an absentee, Jonjo O'Neill's Ladbrokes World Hurdle winner was the 4-7 favourite to extend his winning run to six races, but he was off the bridle a long way from home and finished a weary horse in third place. 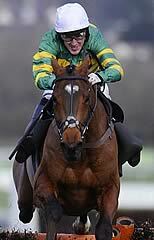 Cole Harden attempted to make it a proper stamina test and had Tony McCoy's mount in trouble approaching the third-last, and More Of That was then readily brushed aside by Medinas, the eventual winner taking charge after the final flight and maintaining an honest gallop to score by seven lengths. Medinas was going one place better than last year for the Alan King team. 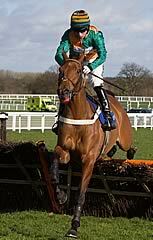 Winning rider Richard Johnson said: "We knew (Cole Harden) would go off and make the running. We thought, realistically, the most sensible thing to do was to bide our time. He's stayed and come through the ground." McCoy said of More Of That: "He got tired. It was very testing ground. It's very hard work. He's a big, gross horse. It's lucky he started off at a lower level and kept on improving." Owner JP McManus scotched any notion of More Of That going over fences this term. He said: "We're disappointed, it goes without saying. You find out everything when he goes to the racecourse. They went a good gallop, but the horse that led beat us well anyway. We'll stick to hurdles this season." Warren Greatrex felt the extra 8lb Cole Harden shouldered for his recent Wetherby Grade Two victory had proved crucial. He said: "The 8lb probably cost us in the end. He's run his heart out and it's killed the third off. I know that one needed the run, but our horse has proved he's up to this level. Gavin (Sheehan) thinks he's still better than this. "This horse is brilliant for the yard. 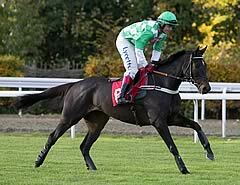 All being well, if I can persuade the owners, he'll be going to Leopardstown for the three-mile Christmas Hurdle there. "He's going there because he's better left-handed and he didn't run very well at Ascot last year. I think while we're still on an upward curve he deserves it. He's going onwards and upwards and up there with the best."